TED has been successful for many reasons. But from my perspective, its success boils down to this: the team cares - above all - about ideas. The organization is a band of passionate, curious, unorthodox thinkers and doers; an idiosyncratic gang who, given a choice, would choose to inquire into, argue over and get excited about ideas over most other life options. 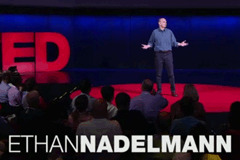 I got to support the growth of TED, TEDx, TED Institute, TED Global, The TED Prize and TED Books, and partner with speakers to write TED talks including presentations with millions of views. I'm proud to have helped share so many good ideas. In addition, I hugged Brene Brown, was snapped at by Sergey Brin, and sat so close behind Bill Gates that I could see his maroon cashmere sweater, like mine, was pilling. Copywriting for a multitude of projects including attendee and speaker communications; conference marketing; a global talent search; TED Prize events; and countless other ventures. While impeccably upholding the CEO's goals, voice and British good manners, wrote as his envoy tens of thousands of emails to speakers, attendees, supporters, fans + foes, VIPs and staff. Live onstage host 'speaker intros' must intrigue and establish credibility – in under 30 seconds without giving too much away. Researched and wrote dozens of these small gems. 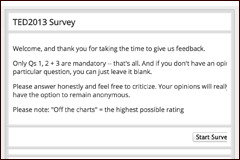 Responsible for post-conference surveys. Analyzed confidential data that impacted all organizational planning. Research into everything: strategic planning, speakers, events, crises, and for CEO's (now bestselling) book. 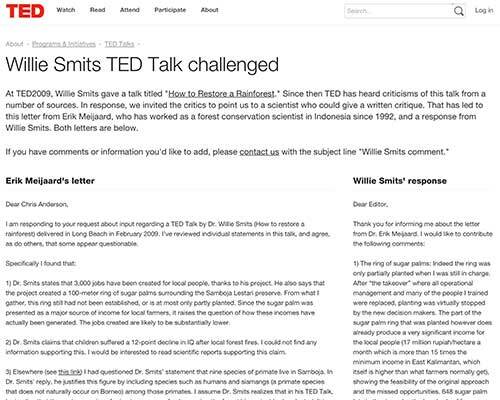 TED Institute talks have received millions of views. Wrote for and managed CEO's Twitter account. Even with 1.7 million followers, Twitter attention is not easy to retain. Fascinating to learn what kinds of posts got noticed. Wrote for the CEO's personal blog, particularly during the devastating 2010 Pakistan floods when he was there on the ground. When he could get internet access, he'd send rough updates and photos for me to craft into full posts. Fast paced excitement and on the fly research and writing for a live Reddit AMA (Ask Me Anything). In September 2010, I sent the CEO a small news item about Apple's plans to create a short-form books series. Naturally ; ) he immediately sent a personal email to Jeff Bezos to suggest that Amazon preempt the idea. No one's claiming credit – but Amazon announced the Kindle Singles concept a month later. I solicited and edited the initial six titles, and TED Books launched less than four months later in conjunction with the launch of Kindle Singles. TED Books is now a major TED division. For TED2014, we created two interactive exhibits: a gallery of 25 iconic TED speakers, and an exhibit titled 10 Key Drivers of the Future. I directed the multi-team effort; wrote, researched and edited exhibit copy; and communicated with dozens of speakers to get both projects ready under tight deadline. Guidance for a Bezos Family Foundation early learning project. New campaign for Bono’s ONE.org. Emergence of vaccine tracking system for GAVI Alliance. Voice recognition software for quadriplegics. National project to fight child trafficking in sync with a White House task force. Upgraded conference communications processes, resulting in significantly improved conference attendee satisfaction and eliminated hundreds of hours of staff troubleshooting. Co-wrote this manifesto aimed at reversing the spiral of email overload. It's received thousands of views, shares and Facebook Likes. Articles in Fast Company, The Washington Post, and The New York Observer.